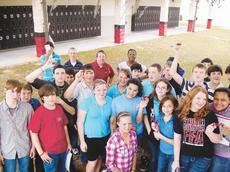 Eighth grade students at South Sumter Middle School are getting a good taste of the “eco” issues of our world and a good handle on race car driving – or at least, solar power model racing. Kevin Strickland and other physical science teachers at the school hosted solar car races on Friday, March 2. The races began at 11 a.m. and ended a unit of study on alternative types of energy. Yes! Yes! At BES, could you guess? Yes! Yes! He’s on the loose, that man we know, that Dr. Seuss! Why fun is found in every book! See there, just look! It’s green eggs and ham they cook! 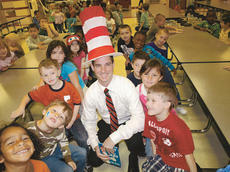 And on it goes as a week of rhyme and imagination fill the classrooms at Bushnell Elementary School – just one of several campuses across the nation to take part in the annual birthday celebration of the late Dr. Seuss. 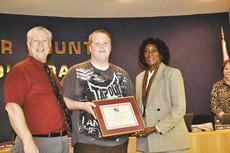 The Sumter County Spelling Bee was held on Feb. 9. Webster Elementary School’s fourth annual Olympics were filled with a blend of fun and competition. This year’s winter event had holiday themes as kindergartners, first graders, and second graders competed in races and games like Reindeer Run, Snowball Chase, and Feed the Reindeer. Grades 3 through 5 took a more athletic focus in the form of mile relays, dodge ball, and tug of war. The Big Springs Regional Science Fair brought out the traditional Sumter County participation, with the best and brightest middle and high school students discussing their science research, experimental designs, and interesting conclusions with a host of judges from a variety of professions. Sumter County students join the competition with students from Marion and Levy Counties. Fifteen-year-old Brett Brett Pless just earned a four-year college scholarship through an essay he wrote on the late Gov. The essay earned him the Governor’s Recognition Scholarship – part of the Florida Prepaid College Board and designed to honor the student for an outstanding essay on a past governor. 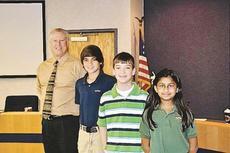 Along with writing skills, the essay is a chance for students to delve into Florida history. 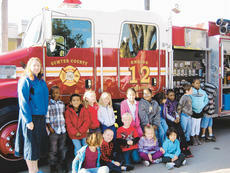 Webster Elementary School received a special visit on Thursday, Oct. 20 as part of Fire Prevention Week. The students were visited by members of Sumter County Fire Services who spoke on fire gear, trucks and how to react during a fire, according to teacher Sherry Remis. Firefighters directed students on what to do during a house fire and even put their fire gear to help children acclimate to the equipment. The idea was to take the fear out of the appearance of the firefighter in gear. During the Aug. 9 LSCC District Board of Trustees meeting, members unanimously voted that LSCC will expand its academic programs to include four-year degrees. LSCC’s four criteria for choosing a bachelor’s degree program are (1) Lake and Sumter counties’ workforce needs, (2) student interest, (3) college assets such as facilities, personnel and financial resources, and (4) partner relationships. There is still time to register for Lake-Sumter Community College’s fall classes. The sixteen-week term starts Aug. 22 and continues through Dec. 10.